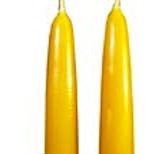 Our exquisitely large diameter beeswax candle tapers are unparallel. We hand dip these candles by the pair with an eye to detail. If you are looking for exceptional 100% beeswax candles, you have found them. The 16" x 1.5" tapers or the 24" x 1.5" tapers will add elegance to any fireplace hearth. These large pure beeswax tapers do need special sized candleholders. The 1.5" diameter beeswax tapers come in four lengths.